Have you ever done something, walked away, and then had to come back to check to see if you did it immediately because you completely forgot? My husband is bad for this when it comes to locking a door. I find myself doing it with the step counting on my watch. I'll check how many steps I have, flick back to the time screen and then a moment later I'm checking again because I can't remember what it said. I know I just checked, but I have no memory of the number even though I just read it! When I found myself doing this last week, I thought of these verses: "Do not merely listen to the word, and so deceive yourselves. Do what it says. Anyone who listens to the word but does not do what it says is like someone who looks at his face in a mirror and, after looking at himself, goes away and immediately forgets what he looks like. But whoever looks intently into the perfect law that gives freedom, and continues in it—not forgetting what they have heard, but doing it—they will be blessed in what they do" (James 1:22-25). Immediately forgets what he looks like...or immediately forgets what her watch says. Same thing, right? In either example, it's a matter of looking at something, walking away and forgetting what you saw. James compares that to someone who reads the Bible, but doesn't follow through on what they read by putting it into practice. Reading the Bible does us no good if it never goes farther than that. We have to use what we read to change how we live our lives. Sometimes that change will be internal, in what we believe about God or about ourselves. For example, if a person has always believed that God is harsh and judgmental, just waiting for us to screw up so He can punish us, then reading 1 John 1:9 should change that perception. After all, "If we confess our sins, he is faithful and just and will forgive us our sins and purify us from all unrighteousness" doesn't sound harsh at all. But reading the truth about God doesn't change us unless we choose to believe it, and then choose to remind ourselves of it when the old beliefs try to reassert themselves. Sometimes the changes will be external, revealing themselves in the way we act. "Therefore, as God’s chosen people, holy and dearly loved, clothe yourselves with compassion, kindness, humility, gentleness and patience. Bear with each other and forgive one another if any of you has a grievance against someone. Forgive as the Lord forgave you. And over all these virtues put on love, which binds them all together in perfect unity" (Colossians 3:12-14). Compassion, kindess, humility, gentleness, patience, forgiveness, love. Reading about them, even nodding our heads in agreement as we read, isn't enough. We must act on what we have read and choose to incorporate those qualities into our everyday situations. Don't forget, James tells us there are two parts to this equation - the reading intently and then the acting upon what we have read. 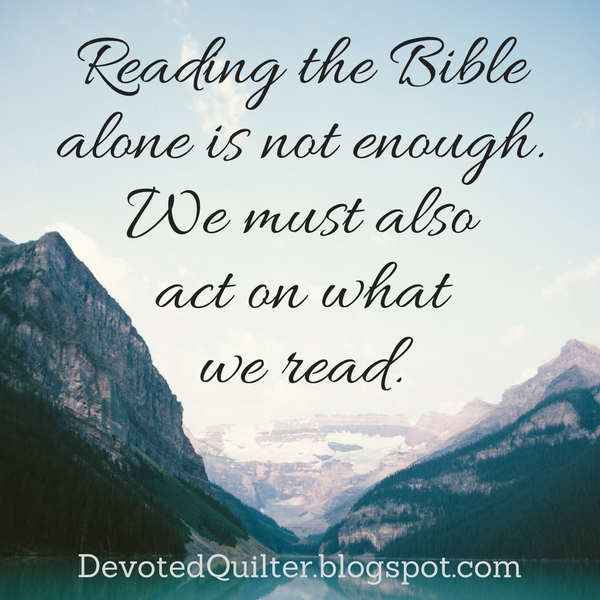 Acting on what we have read is not possible if we never read the Bible, and reading the Bible alone is not enough. We must take what we've read and act on it. Leanne, what a great start to the week! Thank you!